A Saturday Evening Post with Norman Rockwell&apos;s cover image of Rosie The Riveter sat on a display case during installation of a new exhibit portraying the diversity of women&apos;s roles during WWII. One photograph shows the future Queen Elizabeth II as a teenager in coveralls, her head buried under the hood of a truck as she makes repairs to the engine. Her regal mother, in jewels and fur, looks on. In another, the female secretary for an American window-washing company is cleaning the windows of an office building herself — suspended 10 stories up. 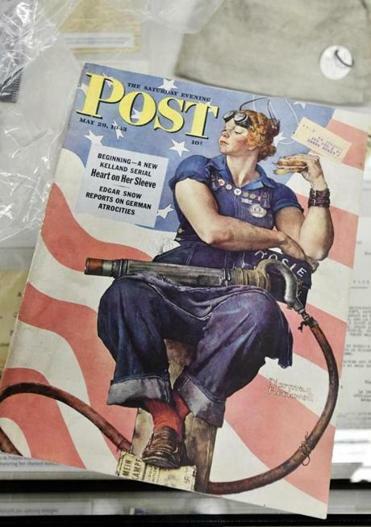 And then there is Rosie the Riveter — the “we can do it” icon of working women’s empowerment — as depicted by Norman Rockwell on the cover of the “Saturday Evening Post.” The date: May 29, 1943. Seventy-five years ago, when that issue hit the newsstands, the world was at war and women’s roles were in upheaval. A new exhibit at the International Museum of World War II in Natick reveals the many ways those changes unfolded. “Women in WWII: On the Home Fronts and the Battlefronts” opened May 25 with more than 100 artifacts, documents, and uniforms from around the globe, including Japan, Germany, and the Allied nations of Great Britain, the Soviet Union, and the United States. Women worked on production lines, flew planes, and in Nazi-occupied countries, risked their lives as resistance fighters. Sue Wilkins, director of education at the International Museum of World War II, showed a photo of British women deploying a barrage balloon during installation of the exhibit. Included in the show is a series of original Ansel Adams photographs that document members of the Massachusetts Women’s Defense Corps training for a variety of emergencies in case the Bay State was attacked, something that Wilkins said was a real fear among Americans at the time. The photos are unusual for Adams, then 40 years old and already famous for his sweeping western landscapes, because some are shot indoors with artificial lighting and most appear posed. But other artifacts in the show highlight the diversity of tasks women did perform in the war, with radical differences depending on what side they were on. Women’s involvement went from being drafted into combat in the Soviet Union as pilots and snipers, to raising children in Germany and Japan through much of the war. The United States fell somewhere in between, with women filling in domestically — like serving as garbage collectors in Chicago in one of the show’s photographs — and in auxiliary military roles short of combat. Sketches show (from left) French resistance fighter Germaine Saint Roumas and her daughter Lillian Saint Roumas, who were both arrested and transported to Ravensbruck concentration camp. One of the show’s favorite stories for museum founder and director Kenneth Rendell is that of US flight nurse Alice Burger, who was decorated after logging 300 hours while evacuating injured soldiers from the Burma-India Theater. She received the honors from a general who adamantly opposed women flying. “Here’s a guy who said women couldn’t fly planes...and here he is pinning one onto a woman,” Rendell said with a laugh. While the show was not planned to coincide with the #MeToo moment — museum exhibits are often planned years in advance — Wilkins said there are some striking parallels to women’s issues today, including sexual harassment. Featured in the show is a cartoon booklet prepared for women going into factory work in the United States. The page is open to a picture of two women, one wearing pants and shirt, the other in a suit of armor and high-heels. Still, Wilkins believes that the most powerful aspects of the show are simple objects that tell a more personal story. There is, for example, one of the dreaded telegrams reporting the death of a loved one. Except this time, it’s the pilot hearing of his mother’s death, killed in a German air raid in East London. 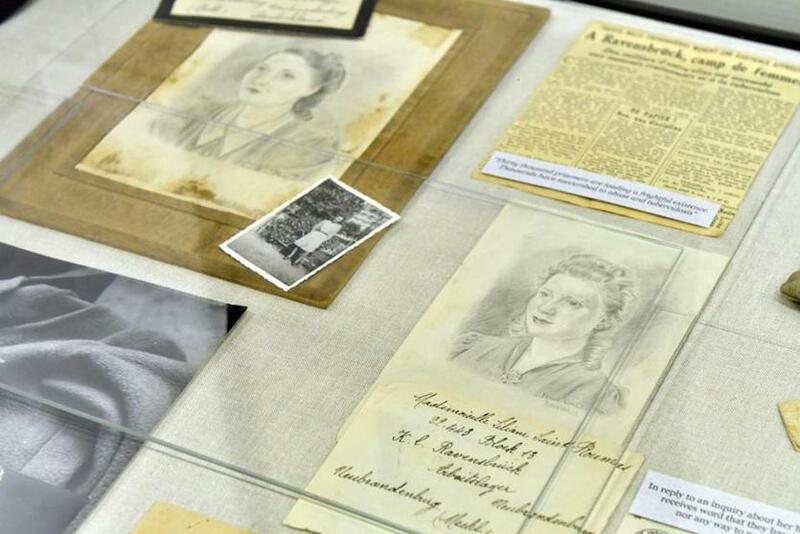 There are also the possessions of a mother and her daughter imprisoned at the Ravensbruck concentration camp, including the dresses they wore, and a letter from the Red Cross noting that the organization had no information about the whereabouts of her husband. In the purse of that mother, Wilkins found coupons for food rations at the camp. And something else: a four-leaf clover. 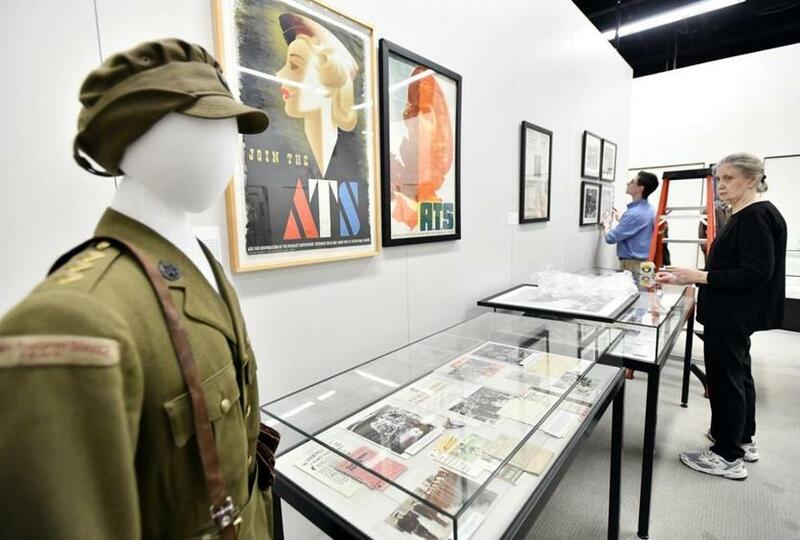 The International Museum of World War II, 8 Mercer Rd, Natick, is open to walk-in visitors from 9 a.m. to 4 p.m. (last entry at 3 p.m.) on Fridays and Saturdays throughout the year and also on Thursdays during the summer. For more information or to schedule a group tour call 508-651-1944 or email visit@imwwii.org. A British Auxiliary Territorial Service uniform and a pair of recruiting posters are part of the exhibit.